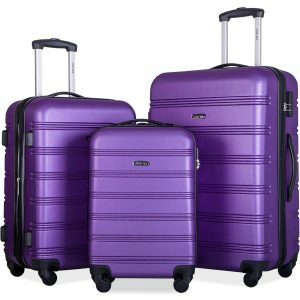 Merax Mellowdy is a new release three-piece spinner hardshell luggage set of 20”, 24” and 28” for your business and leisure trips at a very low price. And the rating is 5 out of 5 stars by 14 customers on the day of this review, which we think is awesome, considering the very low price tag. You can get it in purple, deep blue, orange, red, green, golden, deep blue, yellow, silver and black. The suitcases in the set are made of hundred percent ABS material that is both super lightweight and sturdy. They are expandable and you can make use of the extra 25% storage space when you need it on your trip. The small recessed spinner wheels seem robust and make the bags more mobile and maneuverable as they are able to roll 360 degrees smoothly. All three bags come with the side and top handles to let you hold them horizontally and vertically comfortably. You have a decent storage space inside and your clothes and other items will be better organized with the zippered compartments in the fully lined interior. They come with a three-digit combination lock that is preset to 0-0-0 and you can change to whatever you may remember easily. You will have a peace of mind throughout your journey by using this solid lock. You’ll also find the keys inside each bag, attached to the ID tags and please contact the seller if you can’t find them. You will receive these three bags nested into each other and you will be saving on space in your room by storing them this way. Please note that there is no side carry handle on the smallest 20” cabin size bag which weighs 6 pounds and measures 20 x 13 x 9 inches without the handles or the wheels. The medium size bag weighs just around 8 pounds with the measurements of 24 x 16 x 11 inches. And the largest suitcase is 10 pounds and has the dimensions of 28 x 19 x 13 inches. You can push or pull these bags at any angle on their four spinner wheels or move them vertically. You’ll be able to maneuver easily in tighter spaces too. 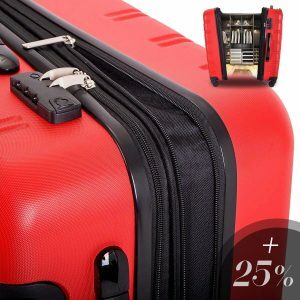 These three suitcases are beautiful looking with great colors, have a sturdy construction, work very well, are very practical and functional, and come with solid zippers. And especially at the low price point you can’t go wrong with them. Despite the low price tag, these suitcases come with a free 5-year global warranty. Merax Travel offers you a variety of luggage with different colors and designs for different tastes.